Getting your venue styling right is a crucial component of any successful event, whether it’s a wedding, a birthday party or a corporate do. Great venue dressing will impress your guests, produce great photographs to savour and share, and prompt people to eat and drink – resulting in a higher turnover at public events. The great thing about venue styling is that it’s all about potential. If you play your cards right, you don’t need to spend an extortionate amount of money on an expensive and sought-after venue. With the right venue decoration, you can use your interior as a blank canvas to be revamped and made over. Focus on other, non-negotiable issues when making a decision about the site for your wedding or other event – such as amenities, outdoor space, proximity to public transport, parking, venue capacity and accommodation. If you get these basic elements right, you’ll be able to use hired furniture and accessories to achieve the look you’re after, wherever you host your big soirée. A good furniture hire company is more than just a supplier. Having helped countless event organisers to style a variety of venues, their expert eye can assist you with advice and suggestions that’ll help you create the perfect venue environment. The best furniture hire companies should offer a free consultation to enable you to find essential pieces needed to host your event. Even if you think you’ve heard it all before, it’s always a good policy to be open to advice. Suggestions and demonstrations from an outsider will often open up venue styling ideas and possibilities that you hadn’t considered before. 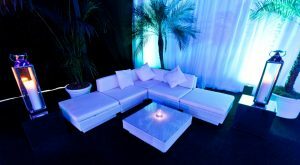 Furniture hire is an especially important aspect to hosting themed events, whether it’s a white party, an outdoor festival or something completely original. Whether you’re holding a beach party with deck chairs or using bar stools at a drinks party, hiring a range of identical furniture pieces can help create the right themed atmosphere at any event. If you’re looking for a chilled out Ibiza vibe, you could choose comfortable and stylish rattan furniture perfect for a relaxed and uncluttered lounge area, or for a classy wedding you can make use of classic marquee furniture with opulent accessories. Whatever the theme, deciding on a range of furniture is an great starting point. 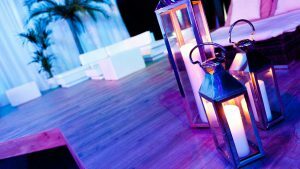 When hiring furniture to decorate and dress your venue, there are certain practicalities to consider. Weather is near the top of the list! If yours is an outdoor event, you’ll need to consider the possibility of poor weather. Consider supplying patio heaters to weather proof your event and keep guests comfortable, in addition to a rainy day alternative such as a marquee. Secondly, check with the venue what is included in the hire package – are any items of furniture included and will you need to request that these are cleared away so that you can hire in your own? Don’t forget to discuss your furniture hire company’s delivery policy and work out the logistics of getting everything to the venue in good time as well as getting it picked up afterwards. 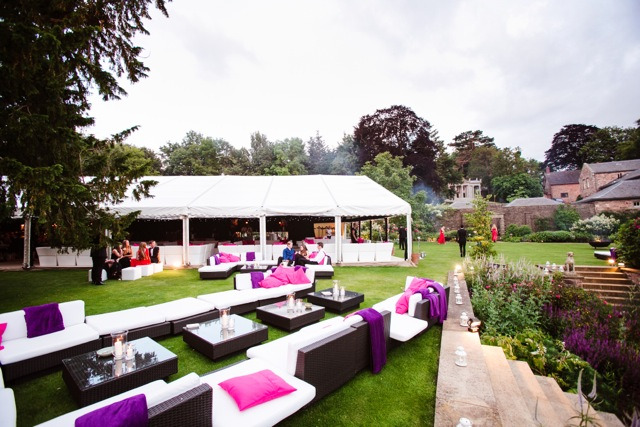 Never under estimate the ability that hire furniture has to truly transform a venue – whether it’s creating smaller ‘rooms’ walled with sofas within a large open space, or enabling guests to chill out in the open air by extending the party outside with comfortable and luxurious outdoor furniture. Try not to make any assumptions about what should go where before you have scoped out your chosen venue. Get a feel for its unique attributes and be open to outside-the-box venue styling ideas to use the space to its best advantage. Arrange your furniture to highlight key features of your venue such as a stunning staircase or amazing view, and where possible, welcome and guide your guests by creating pathways and arches. Create different areas for dining, drinking and dancing, utilising different furniture for each space. Floral displays can be the jewel in the venue stylist’s crown, offering a burst of colour to complement your venue’s features. Choose your flowers with care, taking into account scent, seasonality, the colour scheme for your event and the particular meaning attached to your choice. More importantly, be creative about their display! You could create an eye-catching arrangement inside silver champagne bowls – perfect as a wedding centrepiece. Or if you prefer not to use cut flowers, living trees and planters filled with foliage can provide a more natural feel. With the furniture and flowers in place, lighting design will make a big difference to the overall ambience of your party. Whether it’s a soft and romantic feel you’re going for, or something altogether more glamorous, lighting exudes a subtle power over the mood of your venue and light fittings can also act as accessories to complement your hire furniture. Lanterns are a great addition to outdoor evening parties, light-up marquee letters are an on-trend statement piece that will look great in photos, and our antique-style lamps are a timeless venue styling classic for weddings and other classy occasions. 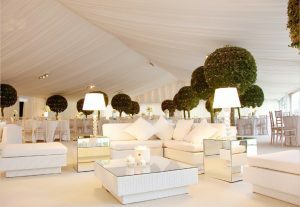 Hiring accessories such as cushions and ottomans can provide the perfect finishing touches to your venue styling. Mirrors provide extra light and sparkle and can add a spacious feel to any room; you might want to consider mirrored furniture like this spectacular Octavia mirror table to reflect your theme. Your furniture hire company should provide a good selection to complement your choice of furniture, so be sure to check out their full range. When it comes to venue styling, the devil is in the detail! When adding finishing touches, pay particular attention to items like napkins and glasses. They may be small, but they’ll be seen up close and handled by every single guest, so make sure they are high quality and fit your theme. Check out our event planning guide to make the most out of your event.